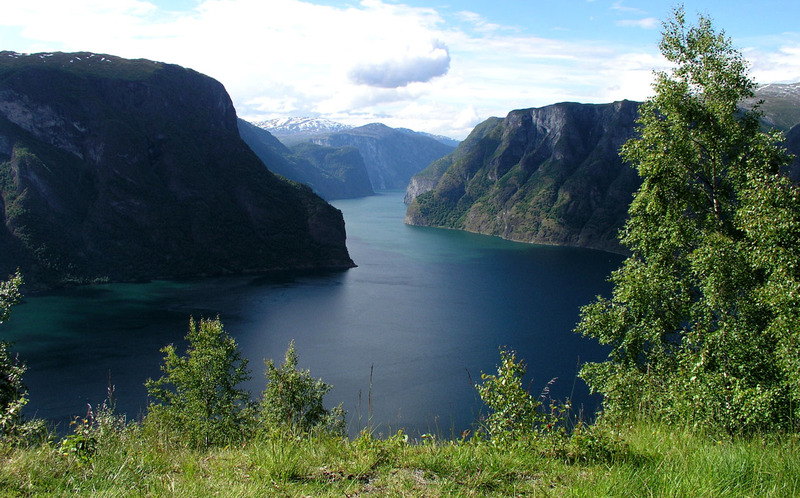 How to get there: The best starting point is the highest point on the road that connects Aurland and Lærdal going across (not through the tunnel!) the mountains. From Lærdal, this road is well marked as you drive down the Lærdal valley, just continue a few kilometer along the (south) left side of the Lærdal fjord. 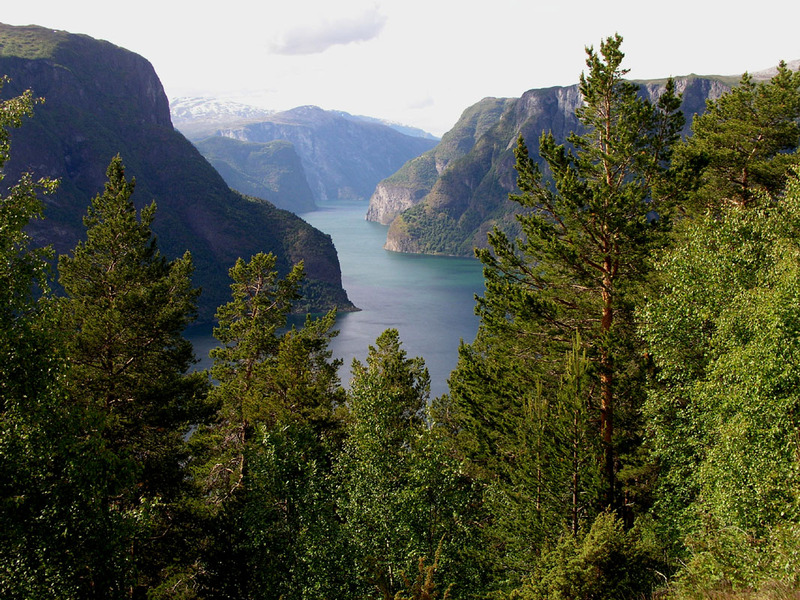 From Aurland, you need to drive down and through the center of the village in order to locate the road that climbs the hillside above the inner part of the Aurland fjord. The trailhead is just north of lake Hornsvatnet (1289m), about 25 kilometer from Lærdal. The elevation was measured to 1306 meter and the GPS coordinates North 60:57.856, East 007:21.497. There is a turnout with parking on the west side of the road at this location. Route description: From the trailhead you will see the characteristic Hornsnipa slightly south. The route heads more or less straight west, in such a way that you pass north of Hornsnipa, but fairly high. There is at least one, possibly two steeper sections when climbing the Hornsnipa north ridge, when I did this hike the snow was good, but steep (YDS class 3 snow), an ice axe (left at home) would have been nice for added security. Although not difficult, this section is the most challenging part of the route. Later in the summer the terrain may look very different and provide an obvious (zig-zag) path upwards. 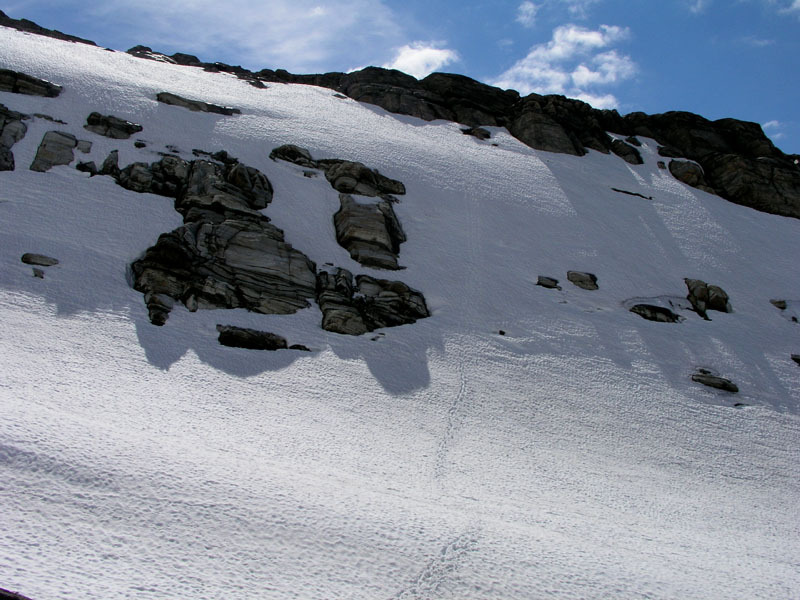 By searching a bit further north (right), there may be slopes that are somewhat less steep. After reaching the crest of the steeper slope, the route continues almost flat, later at a very gentle uphill, essentially straight west. The route follows an east-west ridge, first quite broad, later somewhat more distinct until reaching the gentle, rounded summit. Aside from some possible short sections of (YDS) class 3 terrain, the rest of this route is (easy) class 2, off-trail, but problem free. There are some worn signs of a "T-marked" route, however, one is best served by picking the way as described here. Comments: This peak is the highest point west of the Hwy. connecting Lærdal and Aurland. I should have had skis! Except for the first hundred meter, the entire route could have been skied. To walk 10 kilometer in partly soft snow was hard work. I started on my second hike for the day at 1330, made the summit cairn at 1500 and returned to the car at 1630. (See the description of Store Haugmelen for the first hike.) This mountain was not marked with an elevation nor a name on my standard M711 map of Norway. However, the official height is listed to be 1809 meter. My GPS gave an elevation of 1818 meter, it was only 2 meter high on the previous (1172m) peak this day, consequently this difference of 9 meter is larger than what should be expected. Hiking 25 km with 1300 meter vertical and two nice summits as well as a very scenic drive seeing the fjords in the best possible setting combined to make this a very memorable Sunday. 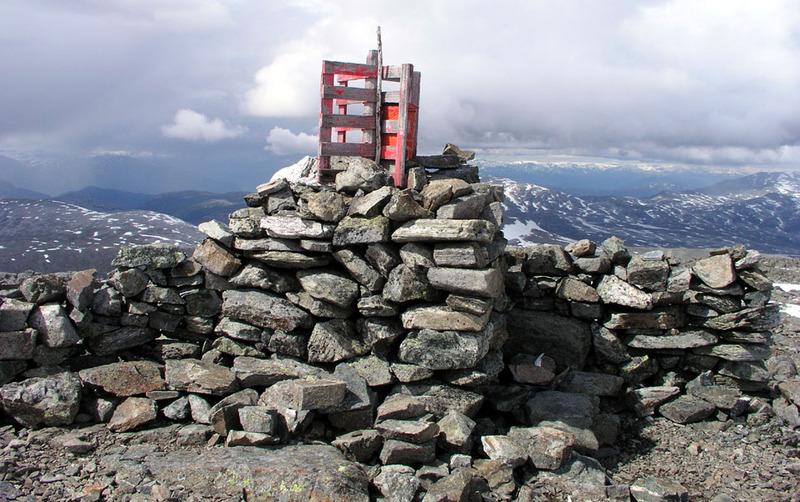 Summit view, south to south-west, Hardangerjøkulen to the south. The very distinct rockface furher west is Ljosberget (1640m). View west, Syrdalsbreen 1761 m.
The "crux" on the route, steep snow. 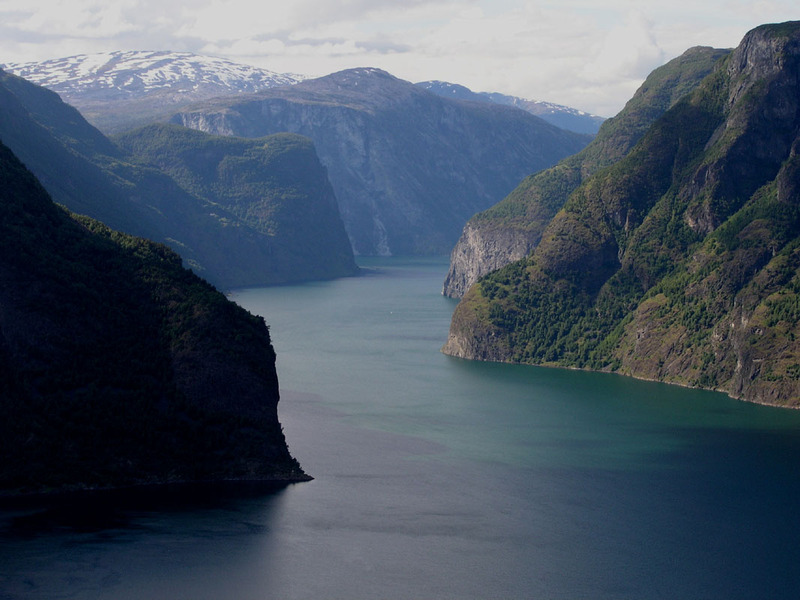 The Aurlandsfjord, a branch of the Sognefjord.